How Do I Properly Care For My Newly Replaced Windows? Home » Blog » Window Replacement » How Do I Properly Care For My Newly Replaced Windows? Proper care of your newly installed replacement windows is important, so that they’ll continue to look great and add curb appeal to your home for years to come. If you have recently purchased and replaced your home windows, you’ll find that maintaining your new windows requires very little effort. Since most vinyl, fiberglass and aluminum products are designed for durability and low maintenance, a minimum semi-annual cleaning is recommended. 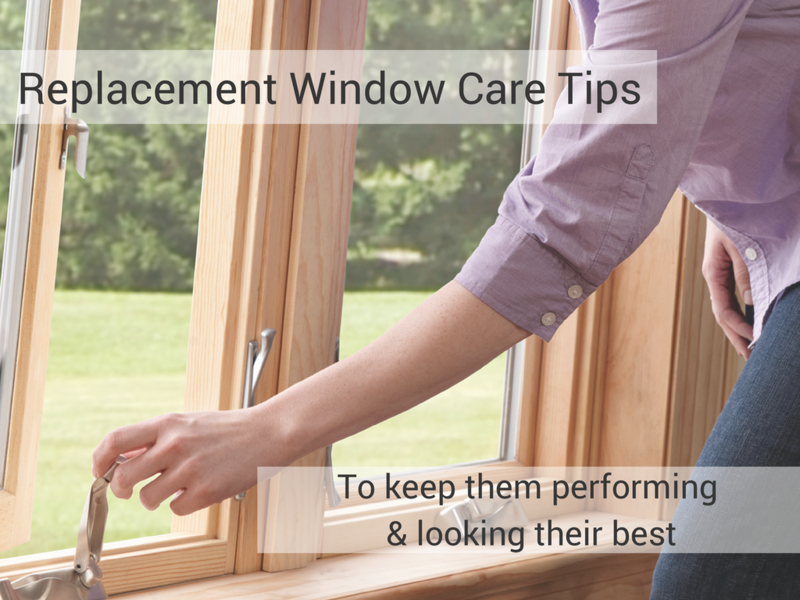 Follow these tips to learn how to maintain and care for your replacement windows, so that they will remain as beautiful as the day they were installed. The interior frames of your windows are very simple to clean and care for. If a little dirt or smudge stains the frame, you can easily wash it with mild, nonabrasive soap and water. Try to stay away from using any abrasive or acidic cleaners as they might cause permanent damage to the frame finish. A good tip is to test any new cleaning product in a tiny, unnoticeable area first and wipe dry when finished. If the stains lift without scratching paint or the frame itself, repeat as needed. Clean the glass – For the exterior windows on a paved outside area or in a bathtub, clean with a mixture of lukewarm water with a squeeze of dish soap. When finished, rinse completely with clear water. Interior window glass can be cleaned with regular or ammonia-based glass cleaners, like Windex. Dry the glass – utilize a lint-free option instead of paper towels. Options include: clean coffee filters, crumpled newsprint, or a microfiber or flour-sack towel. Or, try a small squeegee with a rubber blade. A Quick Tip: Keep in mind that some cleaning products such as petroleum-based cleaners, caustic chemicals, razor blades, putty knives, abrasive pads, or high-pressure water hoses may damage the glass surface or insulating seal of your newly replaced windows and should be avoided. How you wash the individual screens on each window depends on the type of windows you have. Typically, newer windows flip open, enabling you to clean both the outside and inside from the same spot. Most will allow you to remove the screens and clean them separately. When cleaning screens, use only mild soap, water and a soft brush such as a soft brush accessory on a vacuum. When finished, rinse with clear water and wipe dry. Last but certainly not least, here at Frontline Windows and More, Inc. we always recommend that you follow the manufacturer’s cleaning and care instructions for your newly replaced windows. Any cleaning information we suggest is only to assist you. If you have any additional questions about caring for your newly replaced home windows or need assistance choosing the right replacement windows for your home, please contact us.